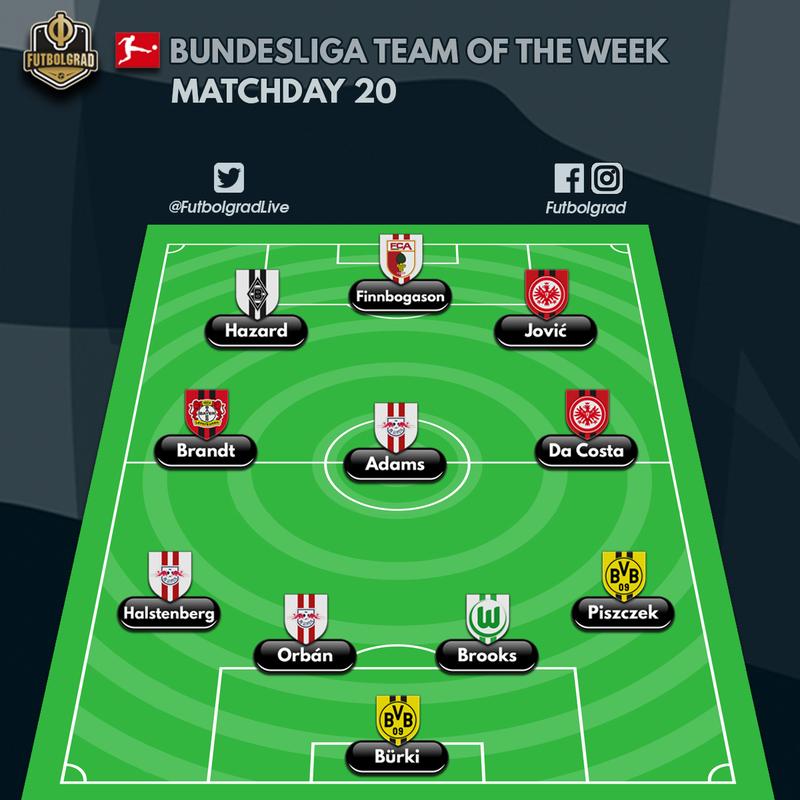 For the first time, the Futbolgrad Network brings you our Bundesliga matchday team of the week as voted by Chris Williams and Manuel Veth on the Futbolgrad Network Gegenpressing Podcast. In goal the decision was easy. Roman Bürki had an outstanding Bundesliga matchday 20 securing his side vital point in the Bundesliga title race. The Swiss keeper made six saves, and two of his five saves were excellent reflexive stops for an overall outstanding performance. Here the team had to make some compromises. There was virtual no debate about the Leipzig duo Marcel Halstenberg and Willi Orban. Both scored on the matchday and Halstenberg, in particular, showed that he would be a good option for Joachim Löw. Meanwhile, Manuel Veth argued for American John Anthony Brooks and Chris Williams got his wish when it came to Lukasz Piszczek. Once again a compromise had to be made when it came to midfielders. But let us talk about Tyler Adams first. The young American was impressive for the second matchday in a row and, in many ways, looked like a Bundesliga veteran rather than a 19-year-old, who only had just completed his switch from America’s Major League Soccer to one of the most competitive leagues in Europe. Adams is joined in midfield by Bayer Leverkusen’s Julian Brandt. Brandt was excellent in Leverkusen’s 3-1 victory over Bayern München and was selected as the man of the match in that game. The two midfielders were joined by Danny da Costa from Eintracht Frankfurt, who helped his side collect one point against Borussia Dortmund. One part of the debate was whether Thorgan Hazard should be placed in midfield or attack. The attacking-midfielder, after all, has played in multiple roles for Gladbach this season. On matchday 20 he was excellent on the right wing in Gladbach’s 2-0 win over Schalke. He is joined by Augsburg’s forward Alfred Finnbogason, who scored all three goals in his club’s win over Mainz. The forward line is complemented by Eintracht Frankfurt’s striker Luka Jović — the Serbian striker scored the equaliser against Dortmund and now leads the league with 14 goals.